Situated less than five miles from George Bush Intercontinental Airport /IAH/ the welcoming Hampton Inn - Suites Houston/North-IAH/Greenpoint hotel is ideally placed for guests who want to catch a flight easily but who want to avoid noise and traffic from the airport. There are four major highways nearby and downtown Houston is just 20 minutes* drive away. 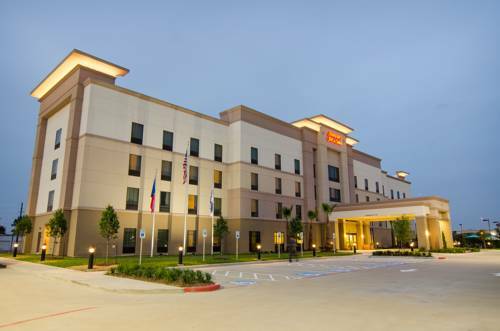 Business guests at this friendly Houston IAH airport hotel will appreciate our close proximity to an expansive commercial district and many major companies. Stay connected in the free 24-hour business center and hold an event in the 1500 sq. ft. ballroom which can be divided into two and is flooded with natural light. Contemporary A/V technology and our friendly professional staff will ensure your training seminar wedding or conference is a success. After a long flight energize in the free fitness center or plunge into the outdoor saltwater pool. Unwind in an oversized guest room or suite equipped with free WiFi a 48-inch TV and a coffee maker. Get a great night*s sleep in the clean and fresh Hampton bed before waking up refreshed to savor fresh-baked waffles at Hampton*s free hot breakfast buffet. If you*re in a rush pick up a free Hampton*s On the Run Breakfast Bag Monday - Friday. The 24-hour Suite Shop stocks all the snacks drinks and essentials you*ll need. Friendly service clean rooms comfortable surroundings every time. If you*re not satisfied we don*t expect you to pay. That*s our commitment and your guarantee. That*s 100 Hampton. Reservations must be cancelled within 24hrs prior to arrival to avoid penalty. Policy is subject to change. David Adicke's 67-ft. tall version of the general who defeated Santa Anna's Mexican Army, was President of the Republic of Texas, Governor of the State of Texas, and a US Senator. The home of "Old Sparky," the state's retired electric chair, as well as displays of prisoner contraband and the Death Gun of Bonnie Parker.